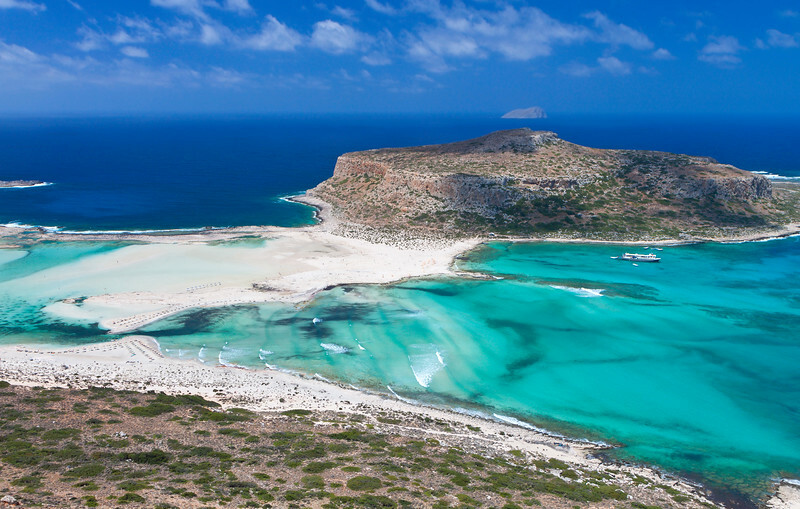 Balos Lagoon is often included as the most beautiful beach in Crete and one of the most beautiful in Europe. 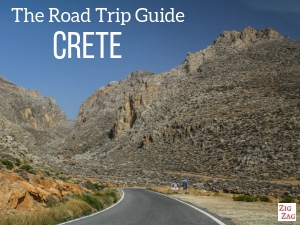 It sure made it on both my lists of best beaches and best places to see in Crete! 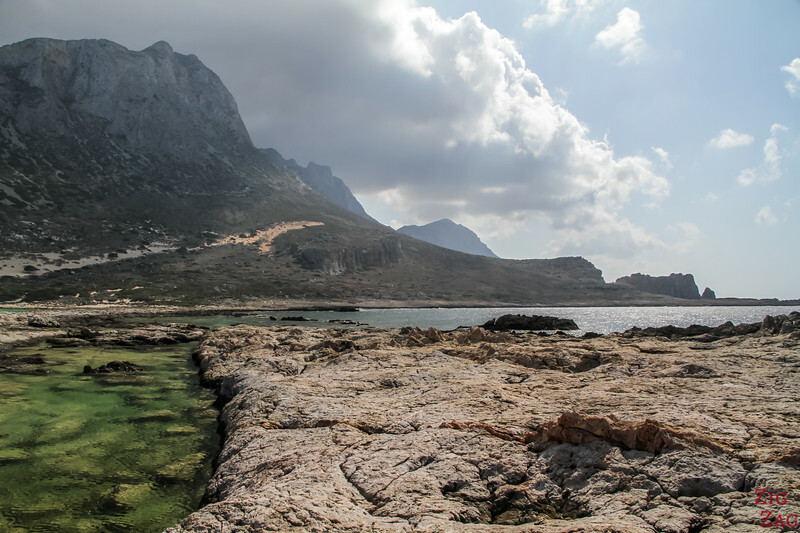 Located at the North West tips of the island, its access is limited (boat, 4WD or hiking). So it has remained mostly wild and with a pristine environment. 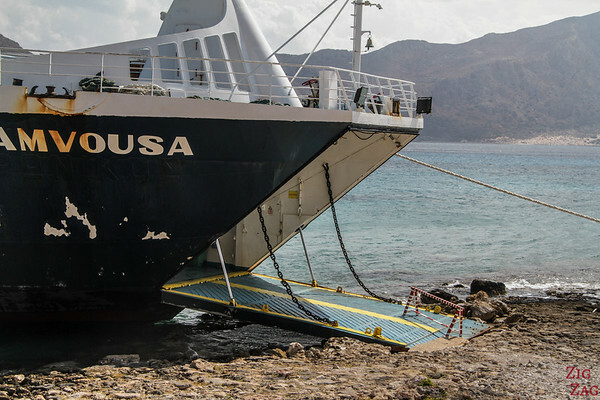 Gramvousa island is only accessible by boat. There are no accommodations at Balos Lagoon. 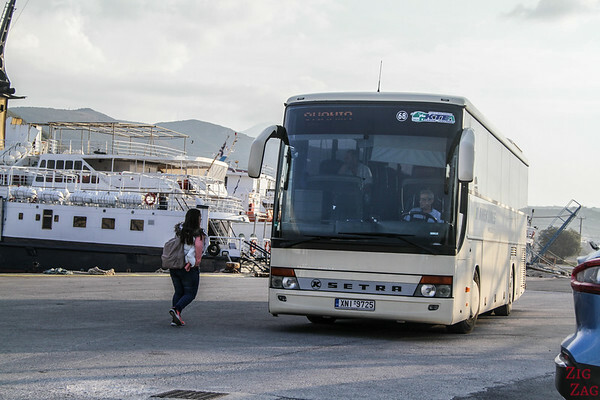 You best option is to stay at Kissamos, close to the port. 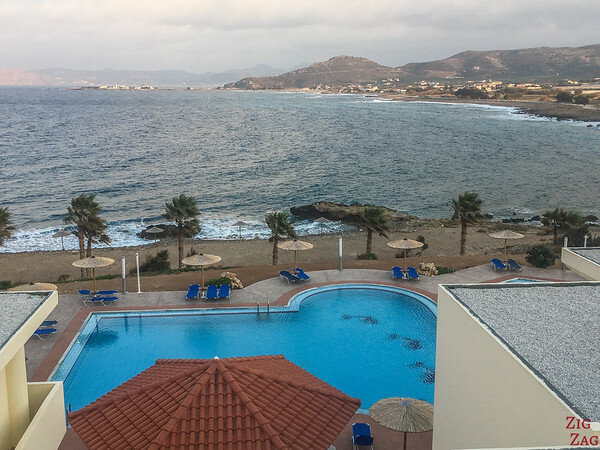 Check out the best rated accommodations in Kissamos. I stayed just outside of town at the Balos Beach Resort (which is not at Balos beach). It is located just before the start of the 4WD track. 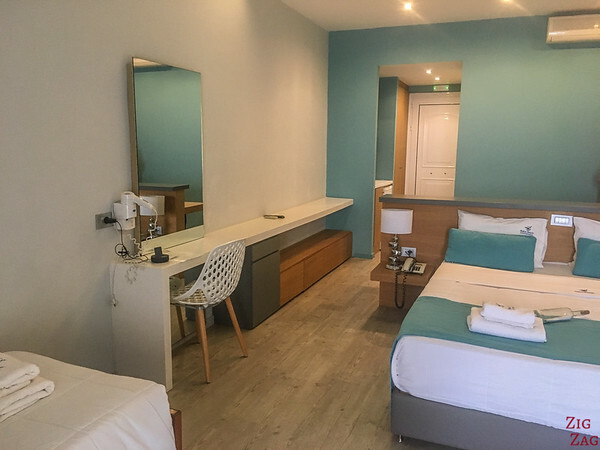 The rooms were spacious and modern, with a large terrace. The food was buffet style and good. 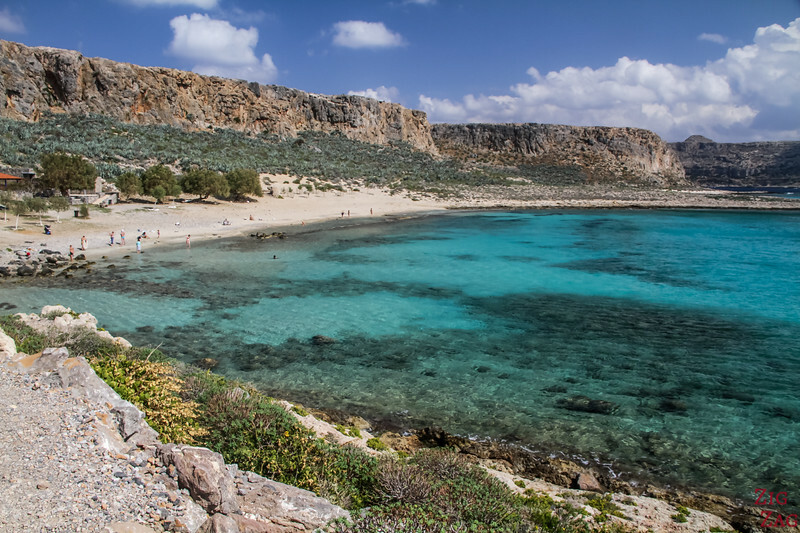 What to see what your the Balos Beach Boat looks like. 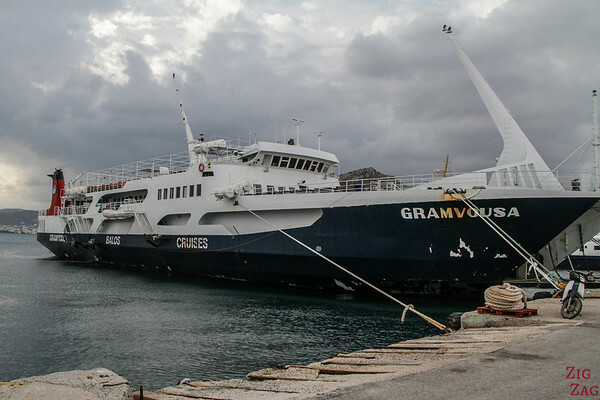 The Balos Cruises company has several boats. 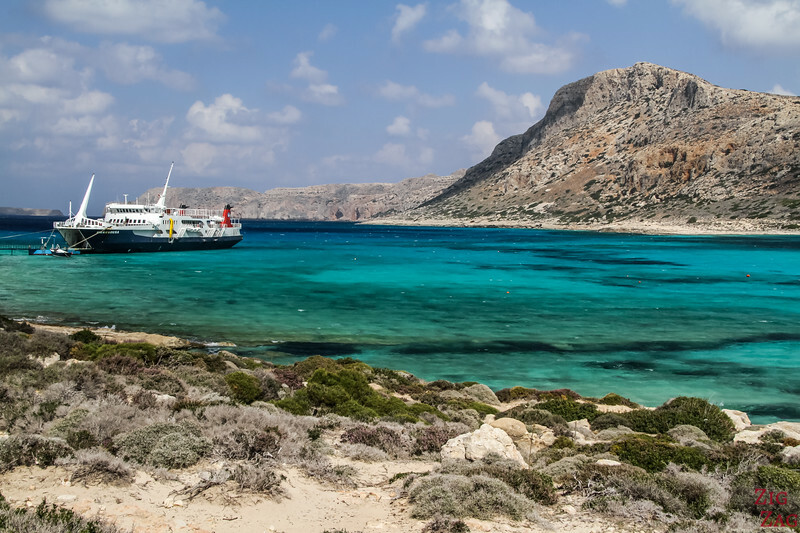 This is the biggest ferry from Kissamos to Balos beach. Its name is Gramvousa. There is lots of seating: some completely outside, some semi-outside (with cover) and some inside (sorry I forgot to take a picture of it). You need to climb around 20 steps to get to the seating area. 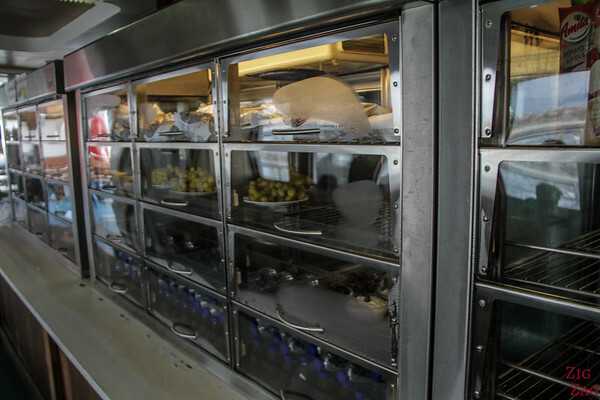 Inside there is a food area with snacks as well as plates of fruits, salads, ice-creams and many different drinks. They accept credit cards and cash. 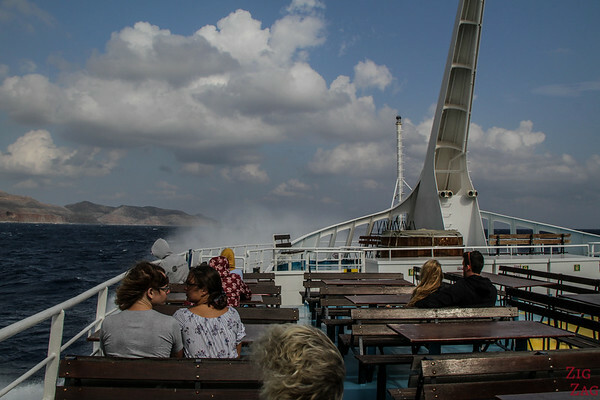 Be careful if seating outside at the front, when there is a big wave you can get splashed and wet! (protect your camera...). When the weather is good, there is the option to enjoy the water slides. However on the day I did my Balos Beach cruise, it was extremely windy, so no slides. 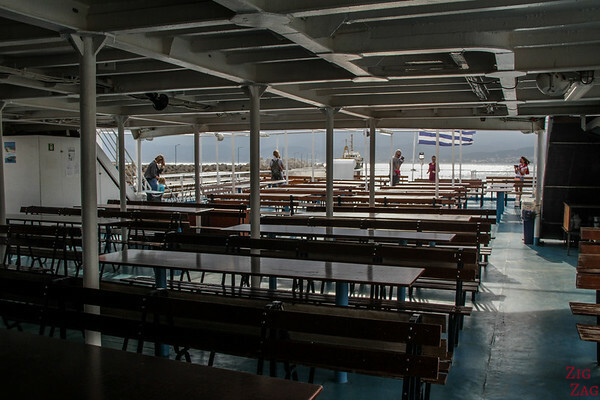 In the video at the beginning, you have seen a little of the cruising part, from Kissamos to Gramvousa. 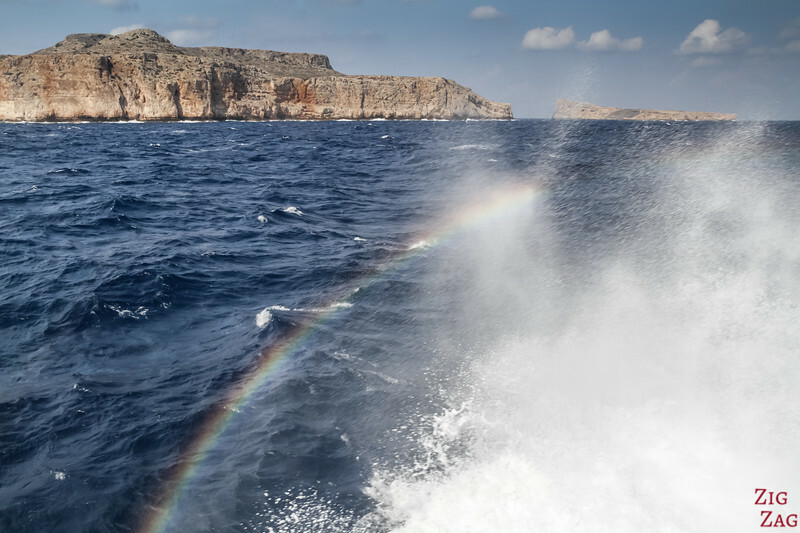 You follow the East coast of the peninsula with dramatic cliffs all the way to Cape Vouxa. 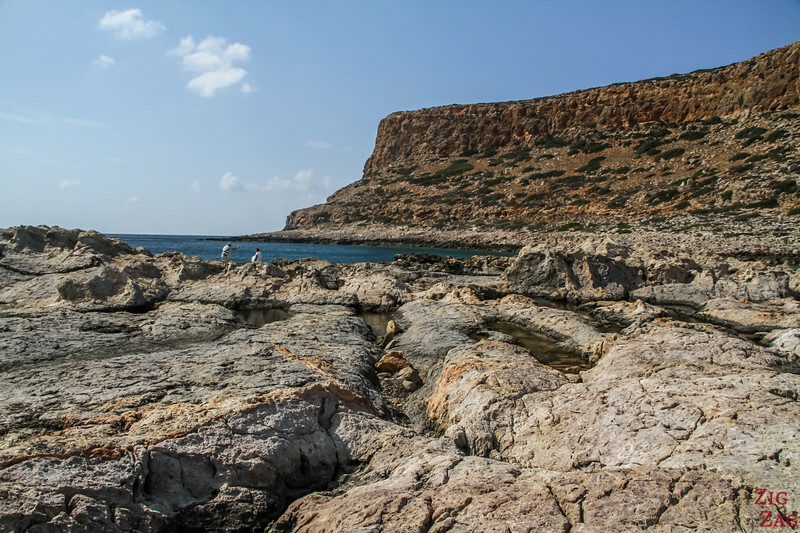 The main point of interest, during this part of the trip is a large cave, thought to be an ancient shipyard. 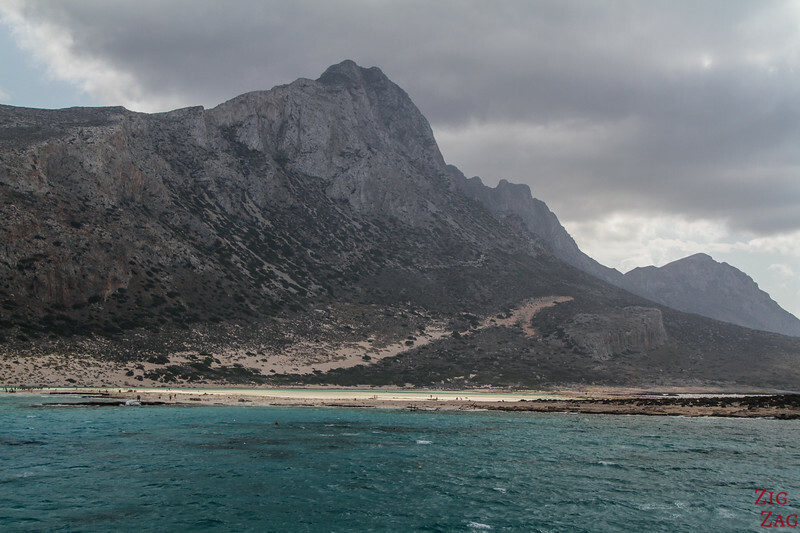 At the North end, the boat turns and sails between the cape and the island of Agria Gramvousa. 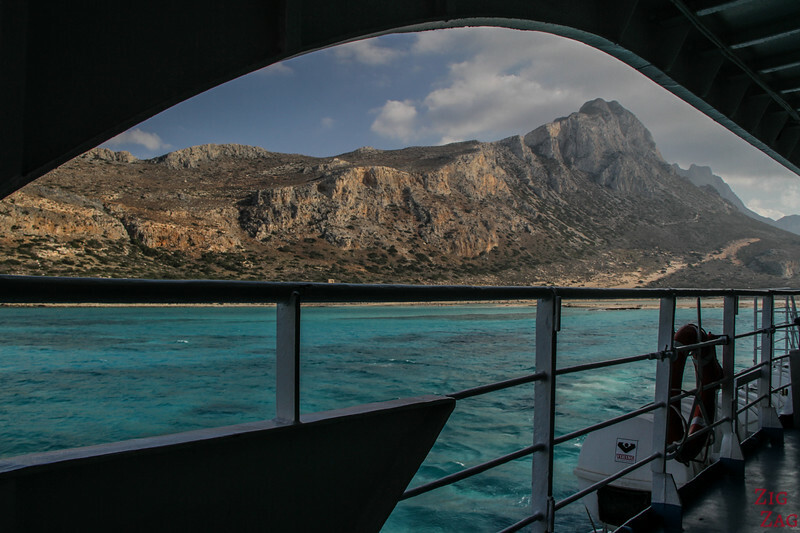 We then sails towards the South between the cape and the island of Imeri Gramvousa with the mountains in the background. 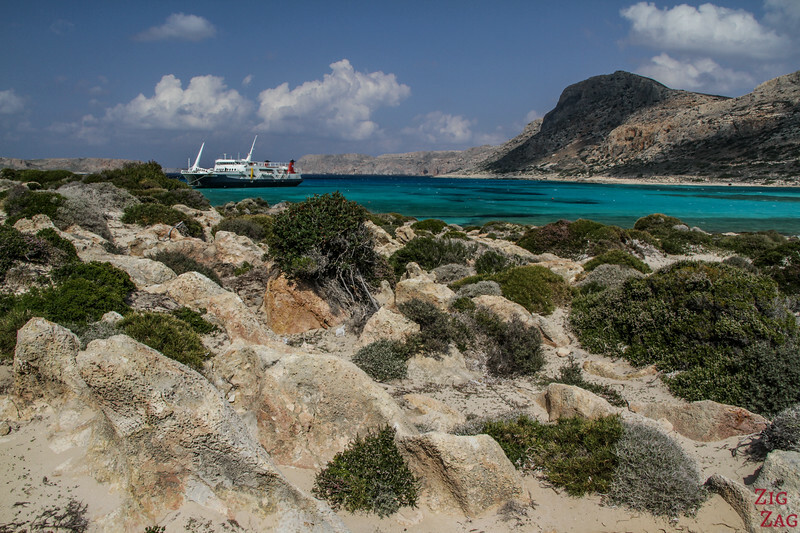 Wondering if disembarking at Gramvousa and Balos is difficult? 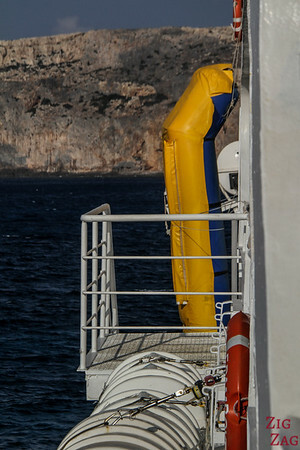 You just have to get down the staircase and exit from the front of the boat. 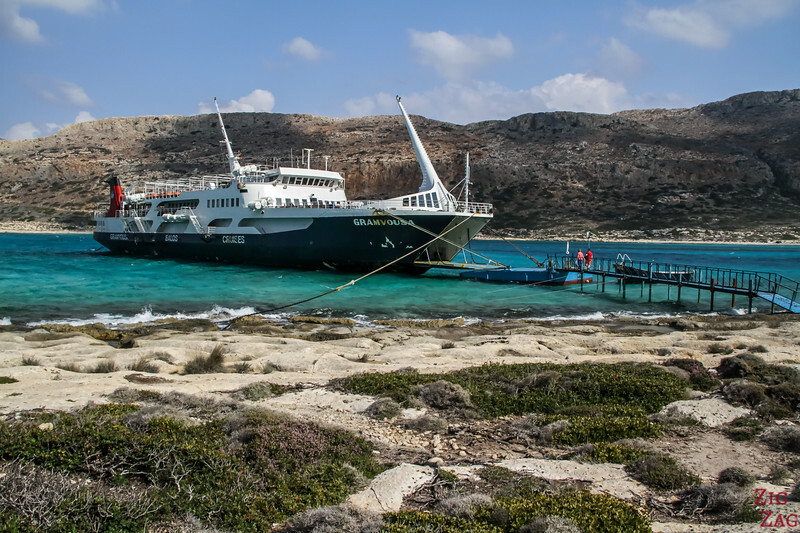 At Gramvousa island, the access was direct on the ground, while at Balos, you disembark on the island of Tigani via a bridge. Your first stop is Gramvousa island. 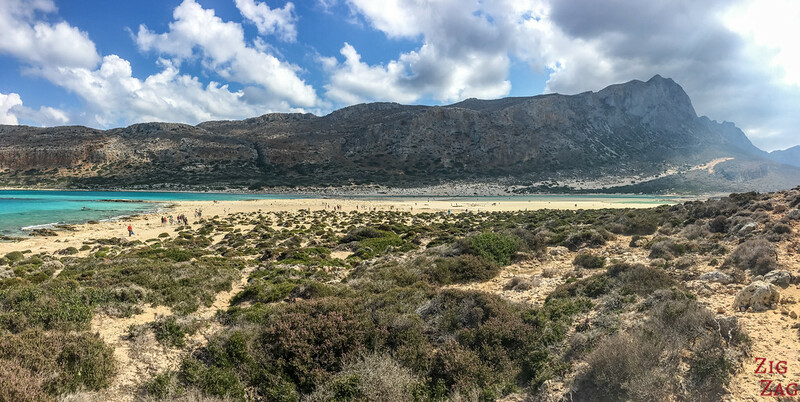 I must admit that although Balos Beach is spectacular, the island was the highlight of the boat trip for me. The island is really mesmerizing with straight cliffs and turquoise water. 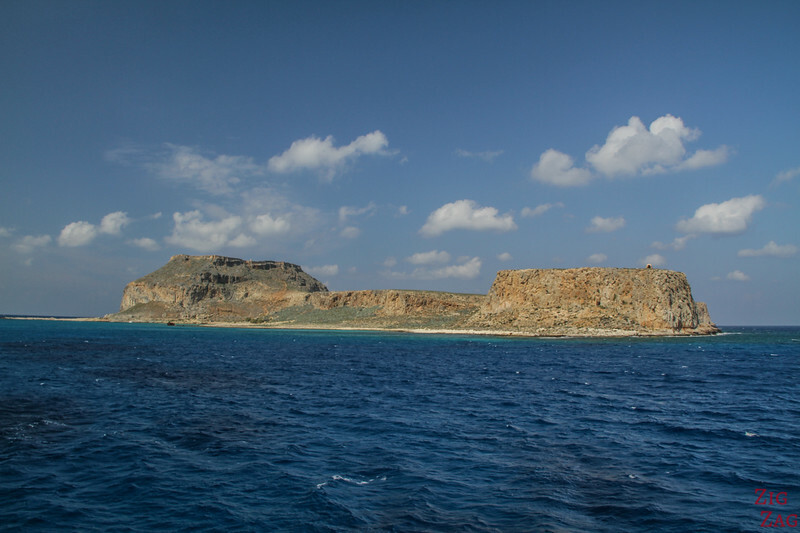 It is often refer to as the Pirate island because Cretan insurgents from the Greek war of Independence became pirates. The shipwreck is a 35m long motor ship. Its name is "Dimitrios P". It was carrying cement to North Africa. 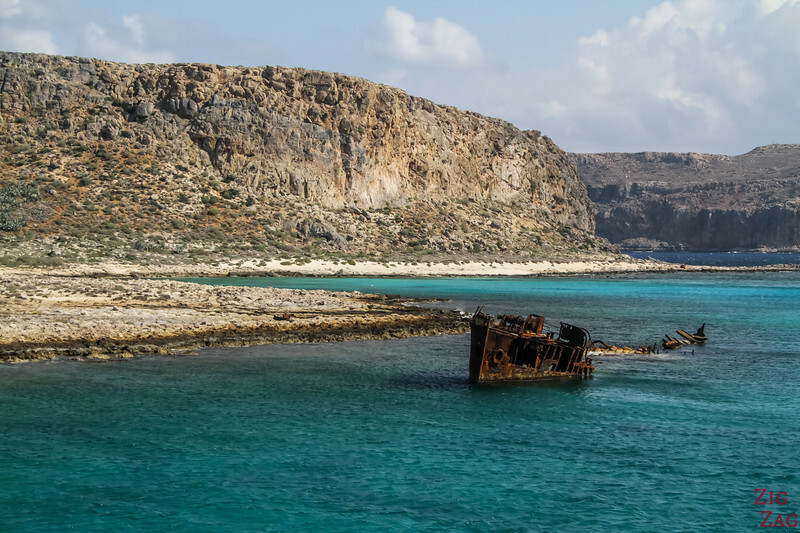 In 1968, because of bad weather, it was forced to fix both anchors near Gramvousa. One broke on the 8th January and the boat got stranded. 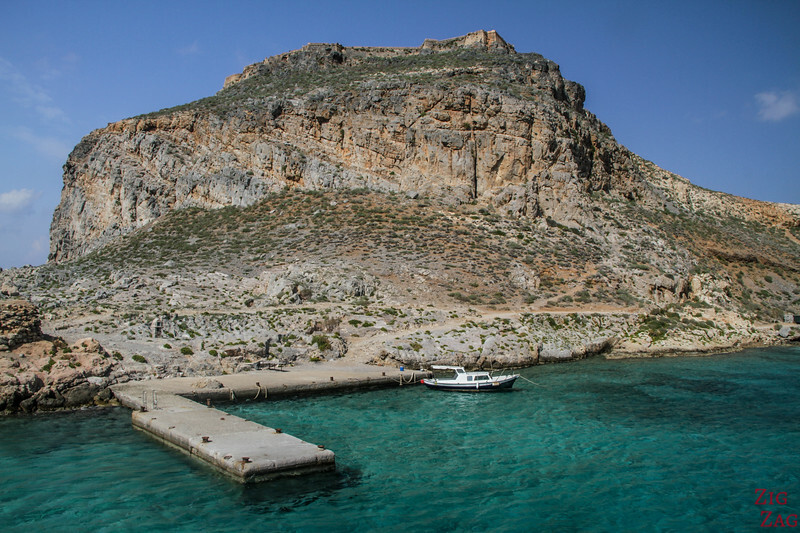 We arrive at the small port on the West side, under the Venetian fort located around the highest point of the island (learn more in the next section). 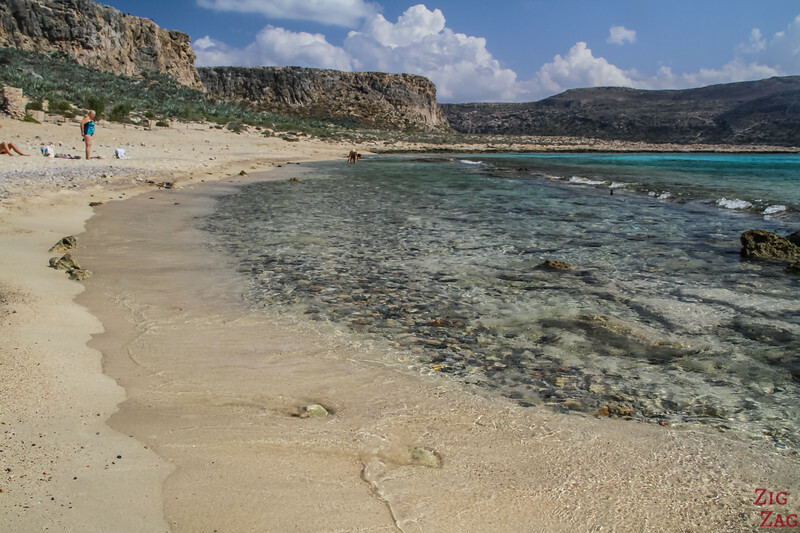 The island, and the whole Gramvousa peninsula, are also recognized for their flora. 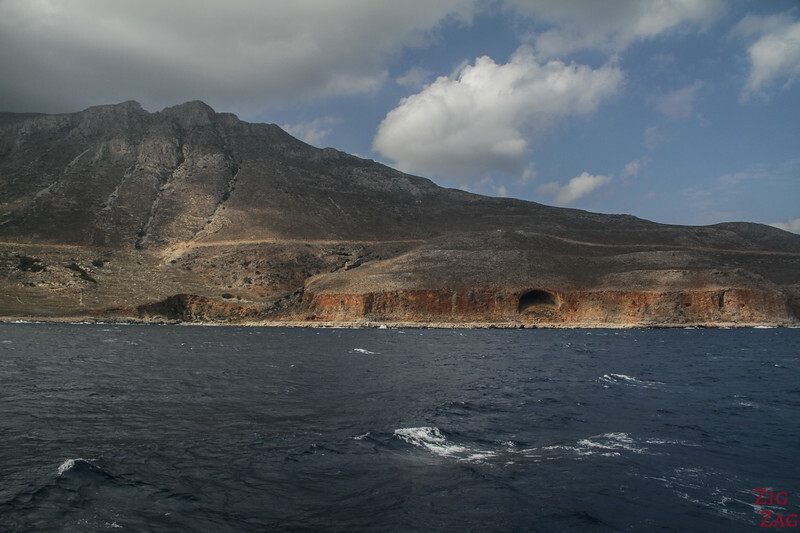 On Imeri Gramvousa there are 173 plant species, including rare one found only on these islands: Anthemis Glaberrima. So stay on the paths! 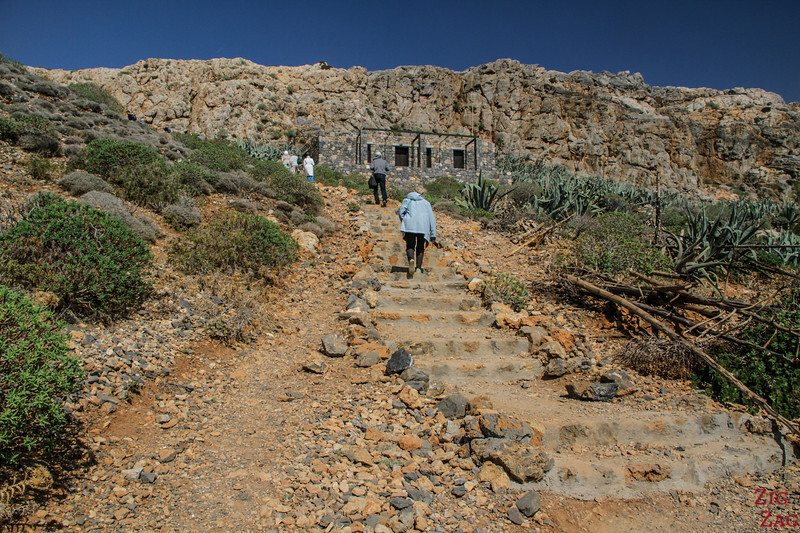 The main attraction of the island are the ruins of the Gramvousa Fortress. It was originally built during the 16th century by the Venetians (1579-1584). 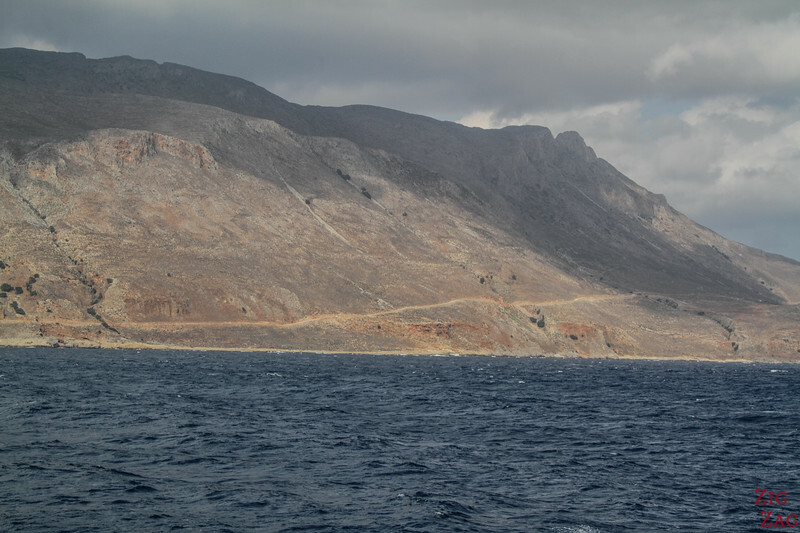 Its location was very strategic to control the strait between Western Crete and the Peloponese. Located at 137m above sea level with straight cliffs all around, it was unconquerable and remained under Venetian control. 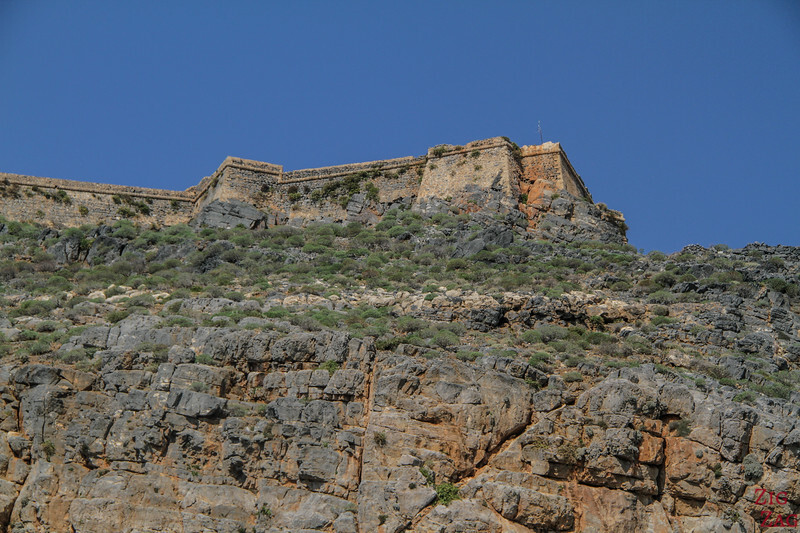 However in 1962, it was handed over to the Ottomans who fortified the castle. In 1825, during the revolution, the Cretan were able to conquer the fort by pretending the be the new guard, dressed as Ottomans. As I wrote it lies at 137m and most side are extremely steep. There is only one path up to the castle with many many steps. Because I had a sprained ankle, I stopped around mid-way. 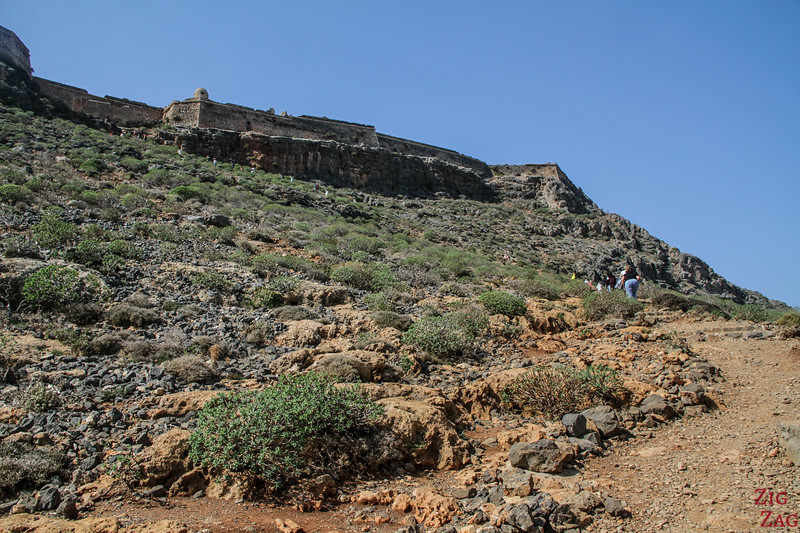 I had climbed 200 steps so I estimate the total at around 400 steps to reach the fortress. Below you can see what I still had to climb. Normally you have 2 hours to explore Gramvousa. However if the sailing conditions are not good, this time can be shorter. In that case evaluate properly your fitness to see if you have the time to get to the top and back down. From the point where I stopped, the view was already magnificent. You can see the beach at the bottom, the boat and in the back the Tigani island protecting the Balos Lagoon. 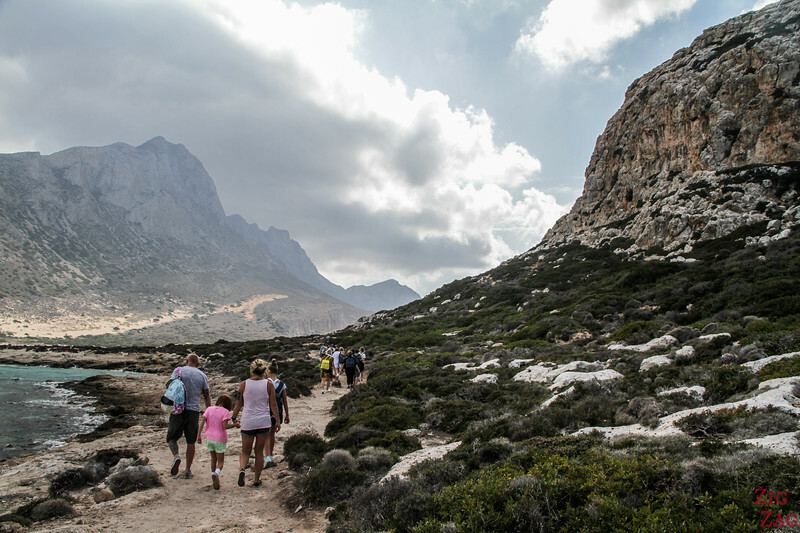 The mountain range behind is, I think, Geroskinos reaching 600m. 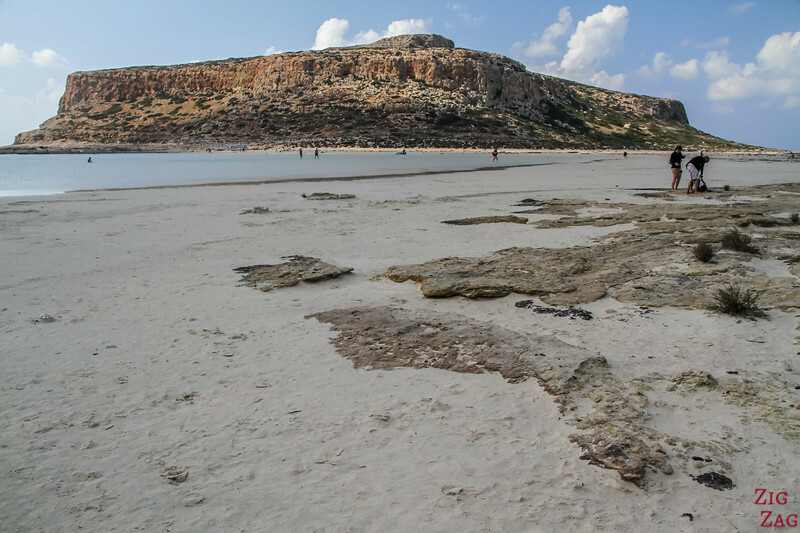 For those who don't want to climb to the fortress, or if you have the 2 full hours, you can enjoy a swim in the warm shallow waters of Gramvousa beach. This is a fantastic spot with great scenery. However beware that there are rocks in the water. 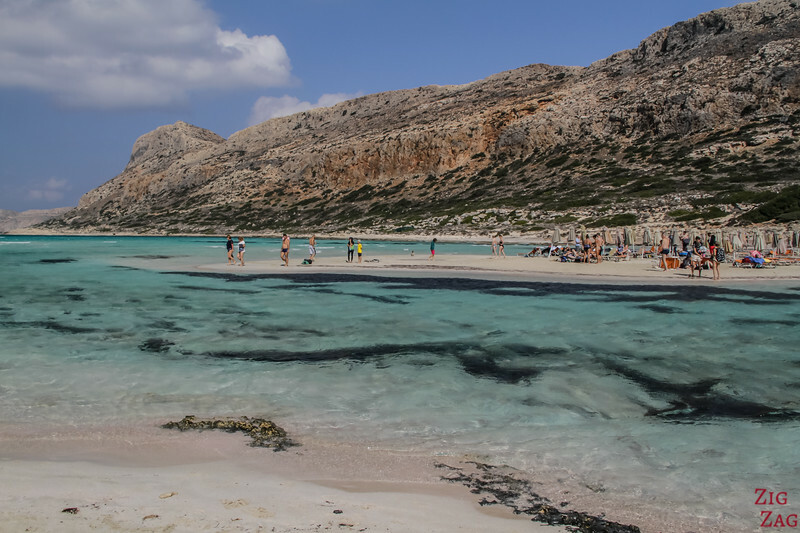 Next stop is Balos Lagoon. 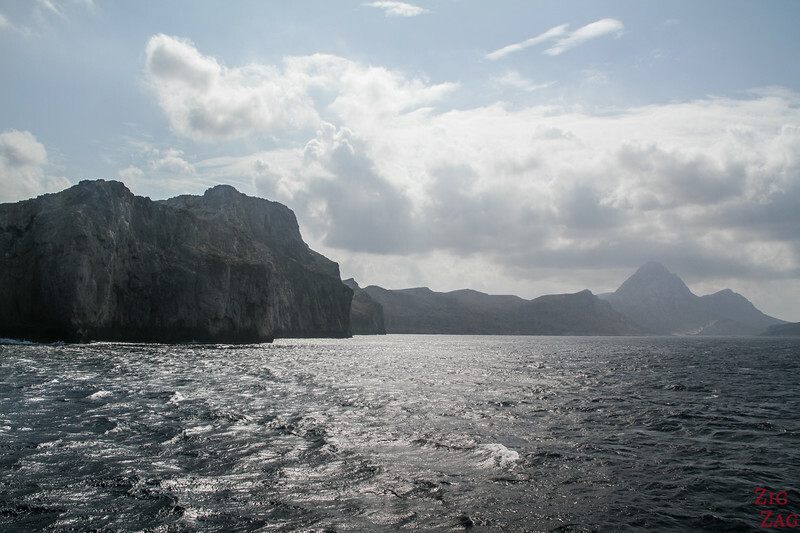 The sailing from Gramvousa to Balos is quite short and splendid. The boat allows you to land on Tigani island, the small mount at Cape Tigani that creates the lagoon. You follow the path for 5min to the sand area. 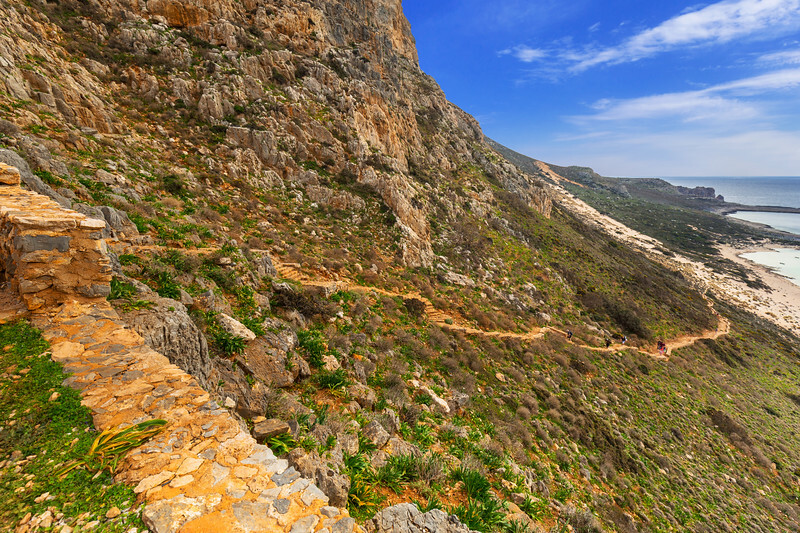 Make sure that, if you decide to explore the island, you need to wear hiking shoes. It is covered of rocks and low scratching vegetation. To better understand the island, here is a picture I took from the other side, after walking along the lagoon. You can see the beautiful shapes of Tigani and how it is protecting the area. 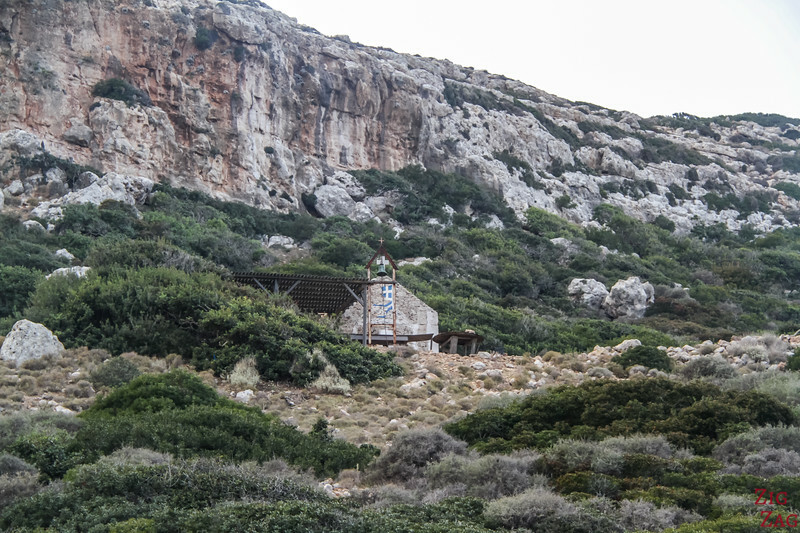 If you don't want to swim much, you can also climb above the pier to the small church of Saint George. But most of you are mostly interested by the lagoon and the beach. Don't worry it does not disappoint. 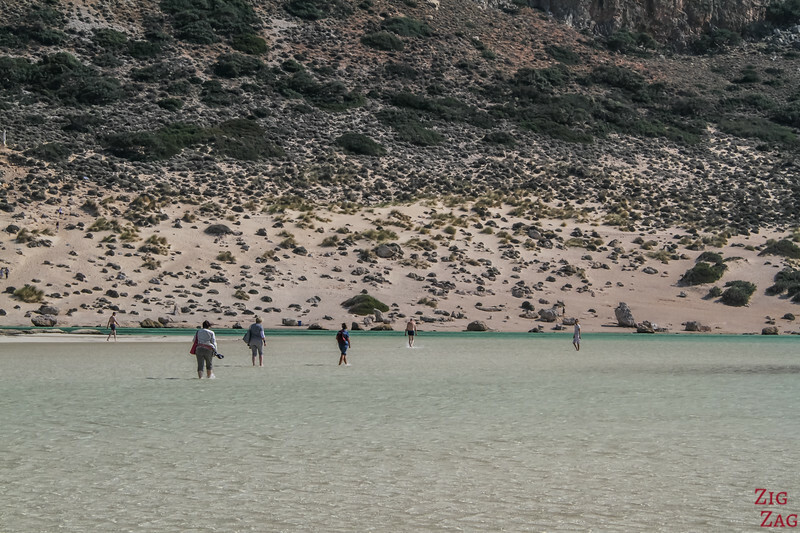 Most people swim on the "beach side" of the lagoon: the waters opening towards the North. They are quite shallow for a long time but still deep enough to enjoy a swim. From there you have a splendid view of the Gramvousa island. There are a few sunbeds. And you can hire an umbrella from the boat. If you turn South, there is the very shallow lagoon with water up to the ankle mostly (up to the knee when walking towards the peninsula). This is calm and great if you have kids. The water here is emerald-color. Further North of the lagoon is a rocky area. The rocks here are fascinating with lots of different colors. Some are pink-yellow-orange. Love it! You can go explore the rocks and reach the other side facing North. Apparently on this side the water is deeper and colder, which is good for snorkeling. There is a turtle in the area but it is shy, so you might not see any. 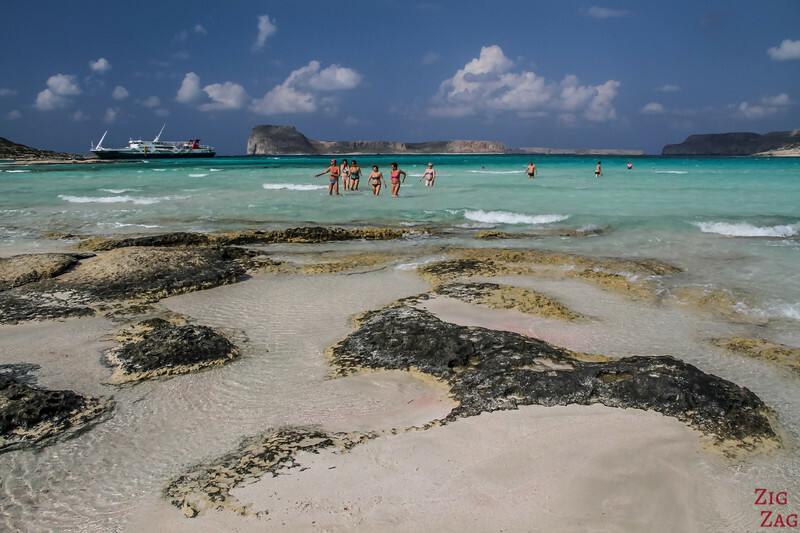 Like at Elafonisi beach (see my article), you can find some pink sand at Balos beach. 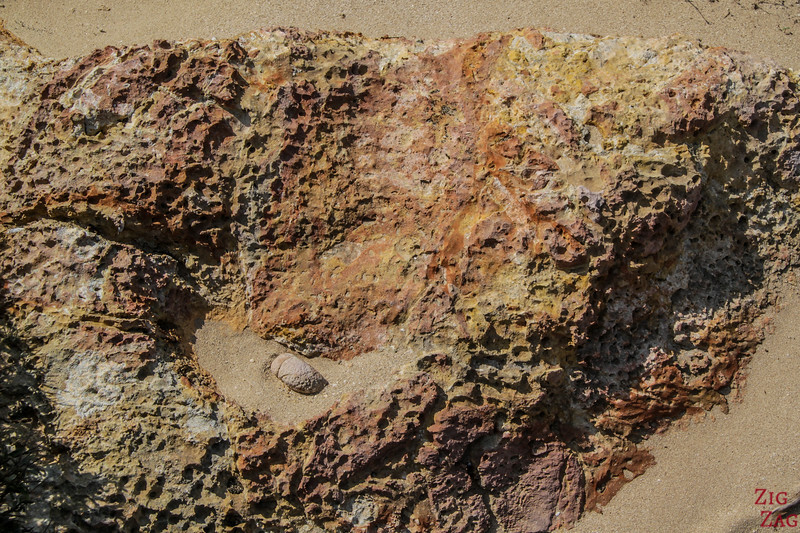 This is due to the millions of pinkish shell bing crushed into sand. 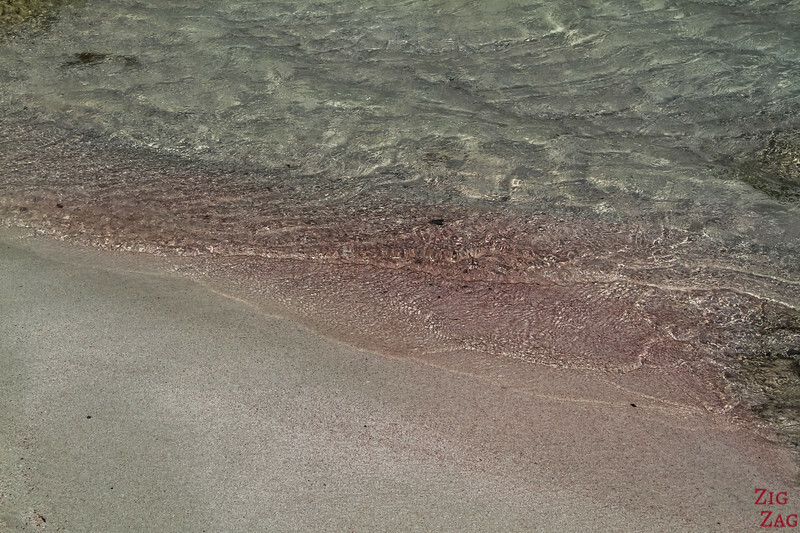 The quantity of pink will vary a lot depending of waves, tide, weather, season... But it is often more pink at the limit of the water. Pay attention where you walk! During the 3 hours at the lagoon, you can climb back onboard the ship any time. 10mn before leaving, it will sound the horn. And it is time to leave and say goodbye to the paradise looking landscapes. 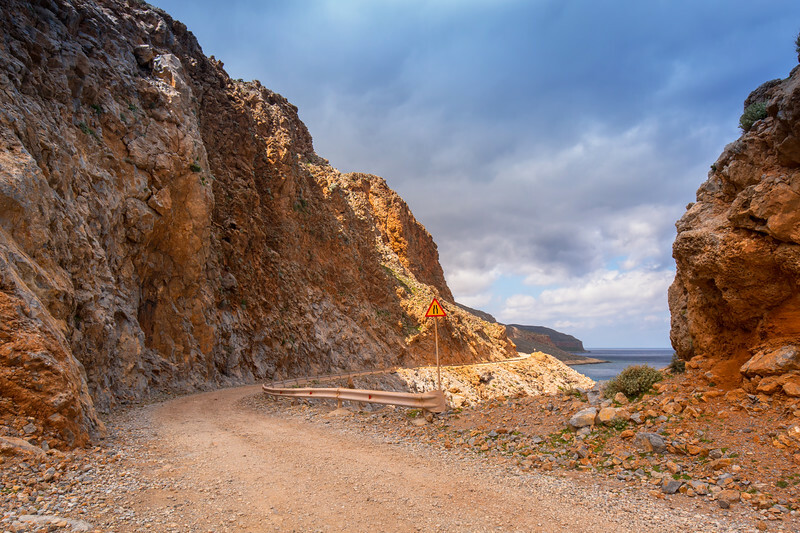 If you'd rather go by road, here are some information on how to get to Balos by car. Below is a photo taken from the boat where you can see the track going along and up. At the end you reach a carpark. But it is not at the beach. You have to walk down a 1km long footpath which is quite steep with mostly stairs. If you choose this option, don't forget that you will still have to climb back up at the end of your stay. Stunning place, isn't it ?